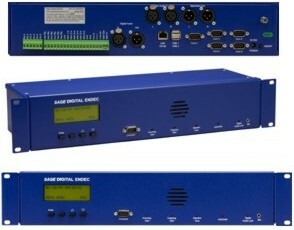 The new sage unit offer some big upgrades over the old sage unit. The LAN network connectivity is a big plus. Setup the unit on your lan from front panel, then connect via webbrowser to unit IP, download and update firmware from sage website, also down load the editing software and audio meters for your browser there. Connect, download your profile, edit it, and upload it back to the unit. This is a good time to setup the email out function, and the FTP (to a website folder). No cap servers yet so that can not be setup. So no printer, yes you can hook up a USB HP printer but its redundant. What we do is just copy and paste from browser weekly to notepad and print and attach to station log. With the FTP function this really opens the door to online eas records and for that matter an online station log. So did I have any issues on install? The FTP and email was a little tricky to setup as it has so many options. The CG and audio for multichannel is the next project I have to work on. It appears with six comports I could run up to six external cg’s so the video crawl may be covered if you have like we plan to 3-4 subchannels. The next issue is audio, so an audio relay may be needed for each subchannel in addition to an eas audi da to each subchannel the sage unit will trip the relay. One interesting idea is to just have all sub channels switch to primary channel that way you only need one cg, you could mask the video with a video genlock (keyer) or just take the CG output plain (no-key) to subchannels.